If you can’t take the heat, get out of the kitchen- don’t just make the kitchen “invitation only”. As a blogger, you open yourself up to encouragement and praise, but you also make yourself a target for criticism and critique. I write each and every post with the nagging mindset that anyone can read this. So far, my readers have been wonderfully encouraging but I know that I may have critics at some point. Thus, I’m careful not to write anything that I am annoyingly passionate about, and nothing deeply personal. That’s just setting yourself up to feel hurt and abused. I follow about 50+ blogs; some are corporately minded, some are photo blogs, and some are a mere whisper away from a tell-all private diary. In one of those diary blogs, this young person spilled their guts (yet again) about their “newfound” purpose in life. By doing so, they completely put down their current vocation in a harsh and hurtful manner. It was completely unprofessional. In the comments, one of the blogger’s readers called them out on the hurtfulness and immaturity of their post. This commenter was firm, but very kind in their rebuke. They said only what needed to be said and nothing more. They ended by telling the blogger that they loved them. Before the end of the week, this blog became “invitation only”. Hmmmm. I understand that criticism hurts. I get that when you are flush in your newfound “calling in life”, then the last thing you want is for someone to pull you up short. But, listen to your readers. This commenter is a personal friend of the blogger; they’ve known each other for some time. If your friends are telling you that you’re not living up to your goal in life, then maybe that should be a wakeup call to take a step back and assess where you are. It’s not a call to get defensive and block all but a choice few readers. So like I said before- if you can’t stand the heat, stop blogging now. You’ll only save yourself a world of hurt and pain. The world isn’t going to get kinder. People aren’t going to become more tolerant of your dreamy-eyed ideals. It’s happened once, it can happen again. It’s time to face the music, accept the comment, and move on. Ironically, this blew up into a bigger deal than it had to be. To gracefully acknowledge the comment and move on with the blog would have been the mature decision; in a few days, the whole situation would have blown over. Instead, every time I see a link to the now-private blog, that situation comes leaping to mind. It was a bad call, if I’m being honest. See? It’s just not healthy. Accept constructive criticism. Not that I think you should change everything about yourself because one person thinks you should; use common sense. However, most of us could do with a bit of improvement, so be open. Don’t post deeply personal thoughts online. No matter how much you may want to share your epiphany, don’t just spew out your latest thoughts. You are much more likely to react emotionally to a negative comment. Just be smart. Don’t be the kind of person where “no thought goes unpublished.” Wait, think, then act. Comments? Compliments? Criticisms? Leave them on the link to the left! A few things moved around, but it should be straightforward. Don’t forget; if you want a nice little email when I post, just put it under “Be In the Know” and hit submit (look up and right!). I’ll make sure that you are kept in the loop! Over the past few weeks, I’ve been on a website periodically doing research for a post. All well and good, but this particular site happens to be a social/threaded site. Clarification: a social website with opinionated and seriously uncaffeinated (or over-caffeinated) people. My blood pressure steadily rises the longer I’m on there. I’m trying to not visit there much now; I’ve pretty much gleaned everything I could ever want to know (and then some). However, I wanted to share this comic with you, dear readers, since it sums up how I’ve felt these past weeks. See what I suffer for this blog? ;) I only hope the the post is worth it. I’ll have it up in a few weeks! 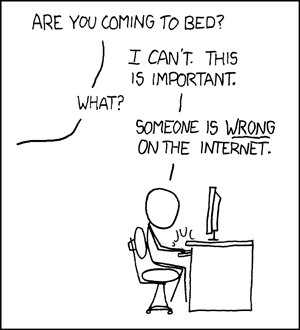 Many thanks to the incomparable xkcd for summing up my feelings! 1. Starbucks card sales will drop. Let’s face it, the real perk is the free wifi. No one really cares about syrup and milk. Birthday drinks/free drinks, yes, but wifi is the big draw. 2. Many much people sitting in the cafe without buying anything. Ummmm, dearest Corporate, our stores are small. We have 9 tables, total. Free loading laptop users like a table per laptop. We have lots of regulars. Where are they supposed to sit?????? 3. Quality. It’s just not gonna stay good. Which is the pits, because I was hoping to break free of my room senior year and get to Starbucks to study. That’s not going to happen if I can’t rely on the wifi signal. Bummer. 4. Speaking of college; how ’bout those poor college students? Think they will buy a drink before homesteading all day by the laptop? Nope, not a chance. 5. Forget about being the “third place”, an “extension of your living room.” We will rename our cafe “Where business people come to hold meetings where they take up tables for hours without buying anything talk loudly and leave trash everywhere because they don’t have a proper office.” I think it’s catchy, don’t you? Okay, readers, open forum. Thoughts, input, good or bad. Can you convince me that this is good for the company? Have at it! Setting: Cafe is fullish, there are several customers waiting for their drinks. Barista: Hi there, can we help you today? RP: Yeah, what’s the deal with your wifi? Do I, like, need a code or something? Barista: It’s actually kept a paid service here. You can purchase a pass from AT&T using a credit card, or you can load a Starbucks card with $5, register it in-store (this takes only 2 minutes), and get 2 free hours of wifi a day. RP: So it’s not free? Barista: Technically no, but if you do the Starbucks card option, that money is still yours to spend here at the store so you aren’t actually paying for the wifi. 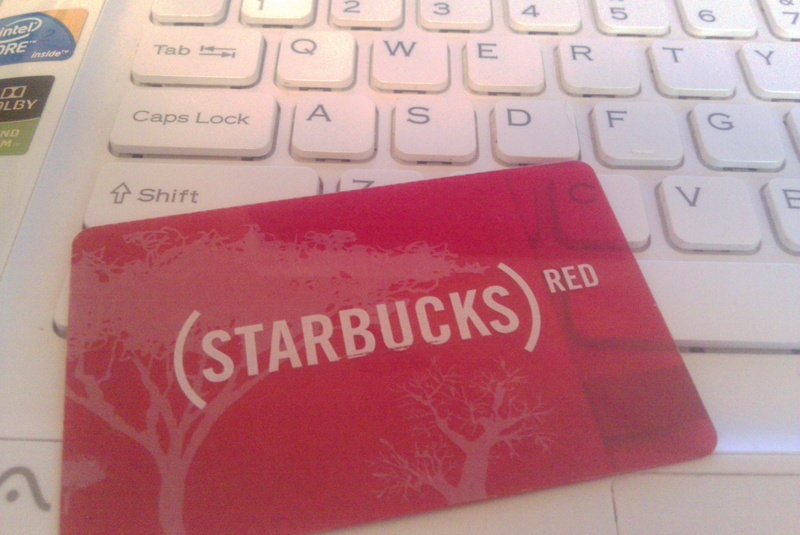 It’s like getting it for free, plus getting the other Starbucks card reward benefits. 1. It’s a marketing gimmick to get people to stay longer at your store. Starbucks already has a solid base of homesteaders; we don’t need anymore people setting up camp. When we have a cafe full of free-loading computer geeks, then our regulars don’t have anywhere to sit. Let’s face it; we *heart* our regulars. 2. It’s expensive to pay for high-quality, limitless wifi. Should this happen, quality is going to drop and people will be complaining about that instead of price. At least now you have little chance of being kick off the network. 3. We will lose a LOT of business should we go to free wifi. People won’t ever feel like making a purchase, and they will keep our paying regulars from having a “third place” environment. There you have it, my thoughts on free, limitless wifi. What are yours; good, bad, helpful, harmful? Leave your thoughts in the comments! Busy, busy, busy. At least, that’s what they’d like you to think about them. They spend the entire time in line and waiting for their drink busily talking on the phone (I’ll out them here: it’s usually to an old college buddy!). Then, they spend hours hunched over a laptop, clicking away with abandon (playing war games- I kid you not). At some point in their visit, an unsuspecting guest standing at the handoff plane will fall victim to their “oops, I dropped my business card, but why don’t you hang onto it and call me if you need my expertise” routine. Seriously, I can’t tell you how many times I’ve seen this move come into play! Common drinks ordered by this type of customer: basic nonfat latte or a plain, small coffee. They are new to business, after all, without much disposable income. The store is their office, our tables are their desk, our customers their target audience. Heating, electricity, wifi, furniture, and advertisement- all for the price of a coffee. It’s a great deal! Not to be a buzz-kill, but Valentine’s Day tops the list of holidays I despise. I’m sure that it’s fine for some people, but the over-sentimentality of the day really grates on my nerves. I do enjoy having a nice evening with my family (dinner, movie, games, etc. ), and that is really the highlight of the holiday. If it wasn’t for them, I’d just as soon ignore the day. The best Valentine’s Day I’ve had so far in my life was when I worked for a florist. 600 roses in one day, and I handled most of them! It’s the most heavenly scent in the world, all those roses and tulips and lilies blending together in the air. I also went out on deliveries. There’s little I enjoy more than knocking on a door, and handing an unsuspecting woman a beautiful bouquet of flowers. Because we write a lot of the cards, I usually know some of the back story to who the couple is and how long they’ve been together. It’s even more fun when we get to deliver to people at work- the shock and awe just makes me smile. Despite not liking Valentine’s Day as a rule, I cannot let the holiday pass by without a little nod to the nature of the day. Therefore, here is a partial list of people I love!